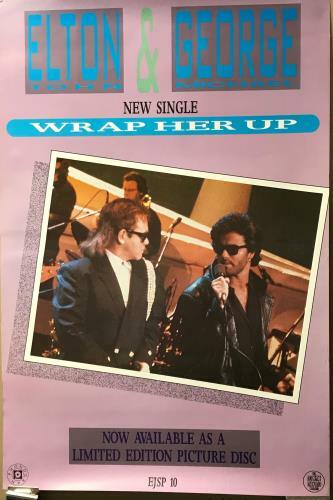 ELTON JOHN & GEORGE MICHAEL Wrap Her Up (Rare original 1985 UK Rocket promotional poster for the limited edition rectangular-shaped picture disc single release. Features the Elton & George colour picture disc artwork with artitle/title text and Rocket logo, on a lilac coloured background. Measures 30" x 20", this stunning poster has never been displayed and remains in near as new condition). or visit our Elton John image gallery.